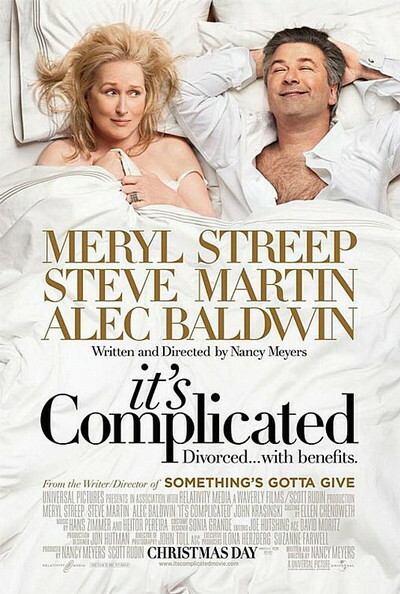 Story: Jane (Meryl Streep) is the mother of three grown kids, owns a thriving Santa Barbara bakery/restaurant and has - after a decade of divorce - an amicable relationship with her ex-husband, attorney Jake (Alec Baldwin). But when Jane and Jake find themselves out of town for their son's college graduation, things start to get complicated. An innocent meal together turns into the unimaginable - an affair. With Jake remarried to the much younger Agness (Lake Bell), Jane is now, of all things, the other woman. Caught in the middle of their renewed romance is Adam (Steve Martin), an architect hired to remodel Jane's kitchen. Healing from a divorce of his own, Adam starts to fall for Jane, but soon realizes he's become part of a love triangle. Should Jane and Jake move on with their lives, or is love truly lovelier the second time around? It's... complicated.